Acting Chairman, Economic and Financial Crimes Committee (EFCC), Mr Ibrahim Magu, said the commission secured 703 convictions from 2015 to date. 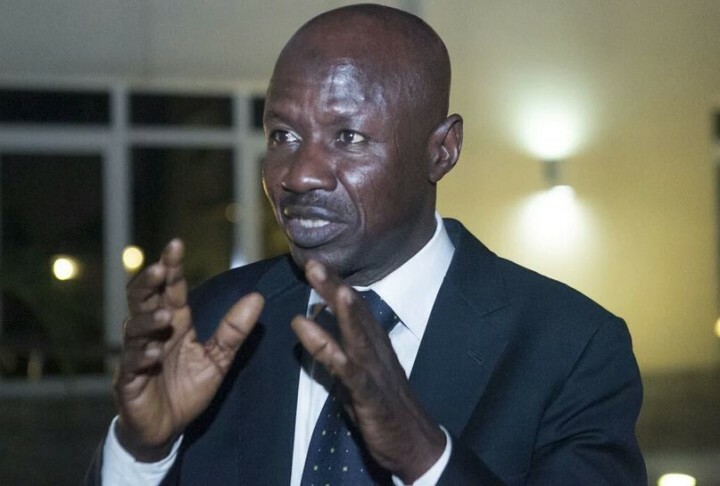 Magu made this known at a news conference in Abuja on Monday to mark his third anniversary at the helm of the affairs at the anti-graft agency. “In the three years that I have been in charge of EFCC, we have secured 703 convictions. For me, it was an auspicious opportunity to contribute my quota to Mr President’s vision of a corruption-free nation. “The opportunity to fully subscribe to President Buhari’s mantra to `kill corruption before it kills us’, was for me, the highest call to duty – one that required absolute commitment and passion. “Indeed, the task of fighting corruption in Nigeria has never been, is not and can never be an easy one,” he said. He said that in 2015, there were 103 convictions; in 2016, 194 convictions; in 2017, 189 were secured while 217 convictions were secured from January, 2018 until date. The chairman said that during the period, “we have set recovery records to the envy of virtually all law-enforcement agencies in Africa. “It is on record that about 90 per cent of all recoveries in Nigeria is through the EFCC, following court orders which granted our prayers for interim and final forfeiture of looted funds. “The recoveries under my watch between November, 2015 and today include over N794 billion. “The Pounds Sterling recovered stands at 1,115, 930.47. The Euros recovered in the period is 8,168,871.13. “There is also the sum of 86,500 CFA and hundreds of properties such as filling stations, petroleum products, land and jewellery. “Also, automobiles, real estate, vessels, hospitals, company shares and heavy machinery and broadcast equipment have been seized from corrupt elements between 2015 and 2018. “A hospital, St. Solomon Health Care Centre, located at No. 24, Adeniyi Jones Street, Ikeja, Lagos, has also been forfeited finally,’’ he enumerated. He added that between May and June, the commission secured the convictions of two former governors, who were jailed 14 years each. Magu said that the battle to make the country a place where foreign investors would be confident to invest in is, without doubt, one that must be fought by all Nigerians. “Perhaps, it is fair to describe the task of championing the anti-corruption crusade as one of the most difficult jobs in the world, because corruption always fights back viciously on many fronts. “Recall also that across the country, EFCC offices and officers, including operatives, lawyers and media personnel, have been physically attacked in the course of the discharge of our duties. He also stated that during the period, the agency pursued the expansion of its operational offices, including new zonal offices in Ibadan, Oyo, Kaduna, Edo and Akwa-Ibom.